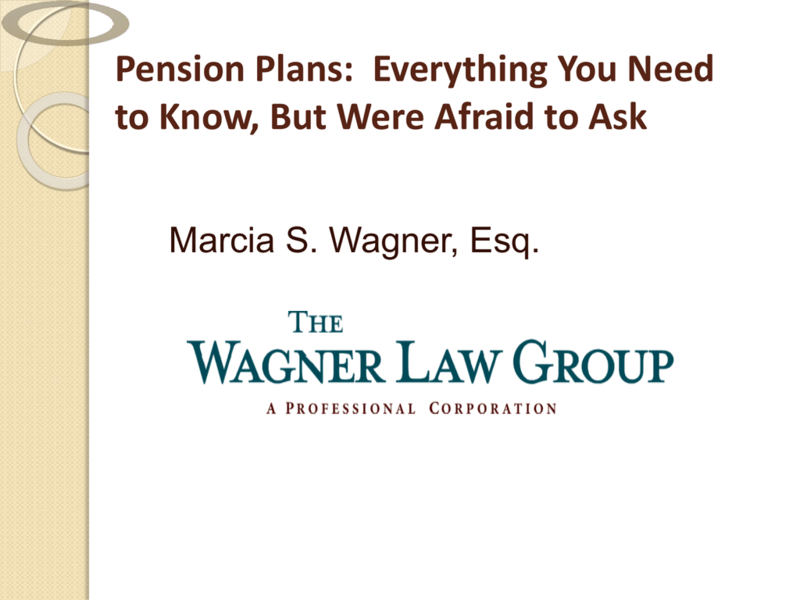 ◦ Federal law governing private retirement plans. 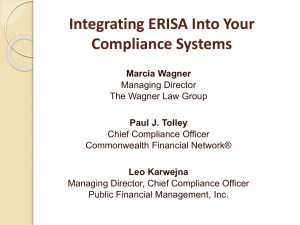 ERISA is divided into four titles. requirements under IRC Section 401(a). ◦ Private employers may adopt tax-qualified plan. Advantages of tax-qualified retirement plans. ◦ Immediate deduction for employer contributions. ◦ Employees are not taxed currently. ◦ Earnings on plan trust assets are tax-exempt. ◦ Tax on distributions can be deferred with rollovers. ◦ Plan assets protected from employer and creditors. ◦ PBGC insurance for benefits under certain plans. ◦ Normally stated in form of life annuity. ◦ Employer contributions are determined actuarially. ◦ Fixed Benefit Plan: fixed $ amount payable annually. ◦ Flat Benefit Plan: % of pay payable annually. of service (e.g., 1% of pay for each year). during employee’s entire service period. portion of participant’s Social Security benefits. ◦ Commitment to contribute to plan. 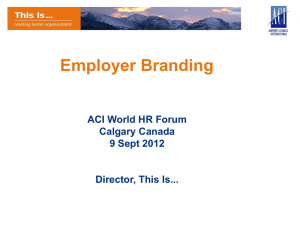 ◦ Fully financed by employer. ◦ Investment risk is borne by employer. ◦ DB plan can recognize past service. ◦ Easier to provide cost of living adjustments (COLA). ◦ May pay disability and death benefits. ◦ Generally may not pay layoff or medical benefits. ◦ No in-service distributions generally. ◦ PBGC guarantee financed by employer premiums. contributions (e.g., target benefit plan). compensation, and employer may provide match. payable in employer stock (e.g., ESOP). ◦ Flexibility in contribution commitment. ◦ Lower administrative costs and no actuary required. ◦ Permit employer/employee cost sharing. ◦ Terms and structure easily communicated. ◦ Generally favor younger employees. ◦ Investment risk is on employees. ◦ In-service distributions often permitted. ◦ Investments may be participant-directed. rules for tax-qualified retirement plans. “rank and file” employees as well as management. ◦ Must not exclude on account of age beyond age 21. (limited exception for 2-year minimum). No maximum age condition permitted. “1,000 hour” rule applies to minimum service. Plan entry may be delayed up to 6 months. (NHCs) to participate in plan must be similar to HCEs. (3) Average Benefit Percentage Test: 2-prong test. against actual benefit accruals of HCEs. additional ACP Test if plan has a match). Must vest upon Normal Retirement Age. Year of service based on “1,000 hour” rule. benefit or contribution if plan becomes Top Heavy. are for the benefit of key employees. more than $165,000 (2012) and 1% owners. ◦ Separate minimum vesting schedule also applies. 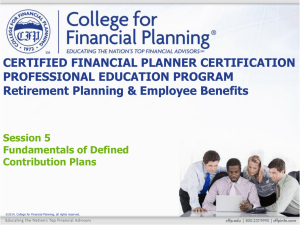 ◦ Plan must not provide “backloaded” benefit accruals. 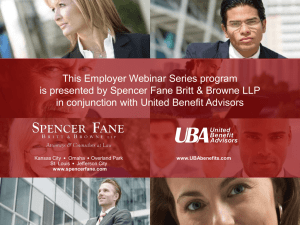 ◦ Benefit must accrue ratably over employee’s career. excise tax if deficiency is not corrected). ◦ Lesser of 100% of pay, or $50,000 (2012). ◦ Lesser of 100% of average pay, or $200,000 (2012). ◦ DC plan – 25% of participants’ pay for year. (minimum required contributions always deductible). ◦ Tax-qualified plan must have written plan document. ◦ Plan document must be timely updated. ◦ Gives employer ability to obtain IRS’s blessing of plan. ◦ Plan should be submitted to IRS every 5 years. whenever law change requires it. ◦ Contributions in cash subject to annual limit. ◦ No life insurance permitted. ◦ Account balance must be fully vested at all times. ◦ IRA must be established by written document. IRA annuity is subject to similar rules. ◦ Each eligible employee owns and controls a SEP IRA. All eligible employees must participate in SEP.
years, and (c) earned $550 in current year. ◦ Employer contributes to eligible employee’s SEP IRA. ◦ Allocation formula must be nondiscriminatory. ◦ Annual limit is lesser of 25% of pay, or $50,000. ◦ Subject to Top-Heavy Rules. 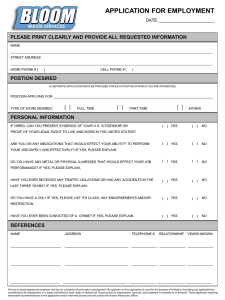 ◦ Annual notice required for eligible employees. (SIMPLE) for small employers only. All eligible employees must participate in SIMPLE. years and expected to earn $5,000 in current year. ◦ Ability to defer up to $11,500 (or $14,000 if age 50). or non-elective contribution equal to 2% of pay. Top-Heavy Rules or ADP/ACP Tests. Traditional IRA contributions are fully deductible. deduction is subject to phase-out if covered by plan. ◦ Earnings accumulate on tax-deferred basis. contribution is subject to phase-out based on AGI. ◦ Contributions are not deductible. ◦ Qualified distributions are tax-free. 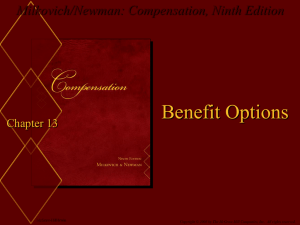 limitations on contributions and benefits. Both types of plans are unfunded. ◦ Plans need not satisfy tax-qualification plan rules. ◦ Discriminate in favor of HCEs by design. remain subject to claims of employer’s creditors. ◦ Plans must be funded. ◦ Plans must be unfunded. ◦ Newly eligible participants can elect within 30 days. 6 months prior to end of performance period. forfeiture for at least 1 year after election. ◦ Special rule if newly eligible in excess plan. ◦ Must elect payment time/form with deferral election. control, unforeseeable emergency, or fixed date. with Payment Election (but can change beneficiary). can elect to defer again for minimum of 5 years. by employer with one ore more employees. 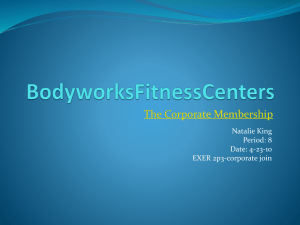 employees (e.g., plan for sole proprietor). I, but exempt from substantive requirements. 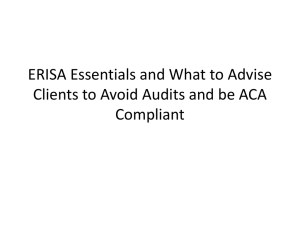 An ERISA plan must have at least 1 fiduciary. management of plan or disposition of plan assets. ◦ Advisors who provide “investment advice”. entity only performs ministerial functions. ◦ If you act or “function” like a fiduciary, you are. Fiduciary standard of care under ERISA. discharge duties solely in interest of plan participants. familiar with plan investment matters. 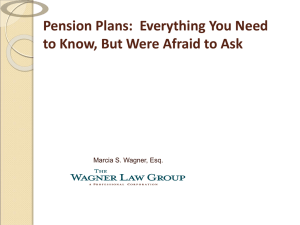 written terms of plan unless inconsistent with ERISA. investments in order to minimize risk of large losses. investments unless plan complies with ERISA 404(c). have enough info to make informed decisions. ◦ Plan menu must have broad range of inv. options. only remains responsible for plan’s menu. duties of prudence and diversification. 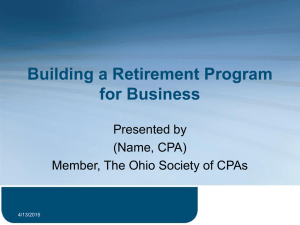 ◦ IPS can help plan fiduciary’s review process. ◦ Ideally, investments should be reviewed annually. Replace funds that don’t meet criteria. ◦ Plan fiduciaries must ensure fees are reasonable. ◦ Must provide non-technical summary to participants. ◦ Written summary of material modifications to plan. ◦ Form 5500 must be filed annually with DOL. ◦ Must cover 10% of plan assets handled. $500,000 ($1M if plan holds employer securities). 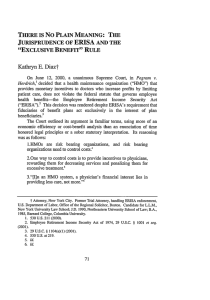 ◦ ERISA bond protects plan. 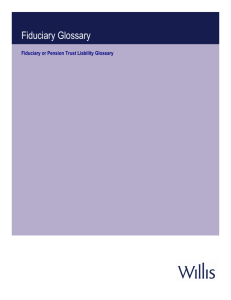 ◦ Fiduciary liability insurance protects fiduciary. ◦ How is business organized? How long in existence? ◦ Benefits provided by employer’s competitors? 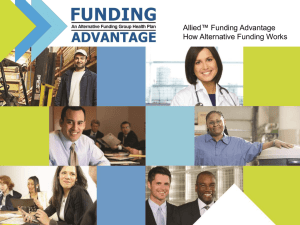 ◦ Will benefit costs be shared with employees? ◦ Tax benefits, including immediate deductions. ◦ Numerous requirements and restrictions. 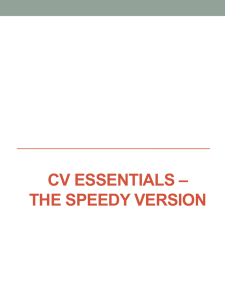 fewer requirements must be satisfied. (or non-elective contribution equal to 2% of pay). ◦ Not subject to tax-qualification rules. ◦ Can be designed as a DB plan or DC plan. ◦ Can not be funded. ◦ Generally cannot include any rank and file employees.